Designed to create ambient textures of sound, from thick and endless hall reverbs to symphonic shimmers. 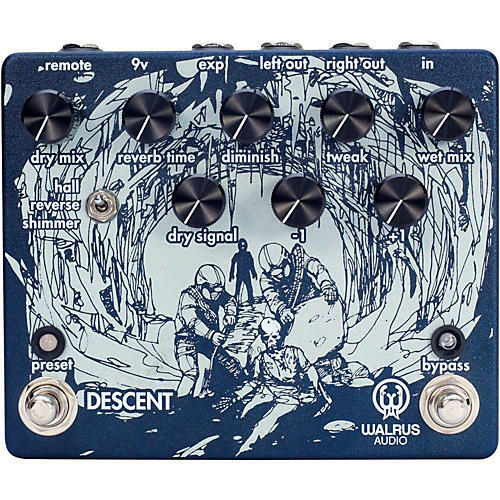 The Descent is a three mode reverb system; hall, reverse, and shimmer. In each mode, the user has the ability to feed +1 and -1 octaves into the reverberated signal. The Hall mode will feature a classic reverb sound that can move your signal from a small-room-echo to a haunting long hall- echo. The Reverse mode smoothly flips your signal to playback unique responses and can be manipulated with pre-delay time controls. Shimmer mode highlights the octave features, dry signal, -1, and +1 to mix in your signal and creates a symphony of sound.